1. Input voltage: 24V DC or 220V AC. 2. Dimensions ( L x W x H): 100 / 50 x 7.5 x 16cm . 3. 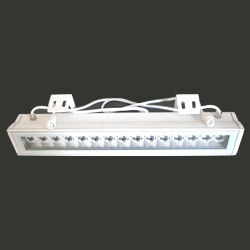 Light source: 15 x 1W power LED (0.5m), 30 x 1W power LED (1m). 4. Full range of colors: cool white, warm white, red, green, blue, amber, and RGB color-changing. 5. CCT: white (6,000 - 6,500k), warm white (2,800 - 3,200k). 6. Wavelength: red (620 - 630nm), green (520 - 525nm), blue (465 - 470nm), amber (590 - 595nm). 7. Beam angle: 15 degrees / 25 degrees. 8. Beam distance: 10 - 15 meters. 9. IP rank: IP65 (waterproof). 10. Aluminum alloy housing. 11. No UV or IR radiation. 12. Net weight: 2.5kg ( 0.5m), 4.5kg ( 1m).